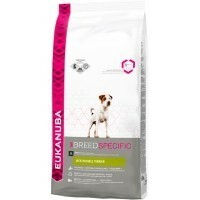 Eukanuba Breed Jack Russell Terrier Adult 2Kg for the nutritional demands of adult Jack Russell Terriers, for strong joints and muscles, optimal weight, healthy teeth and gums. Among the characteristics of the Jack Russell Terrier are a robust, strong body, excellent, protective fur and the predilection to get dirty. Eukanuba Breed Jack Russell Terrier contains chicken, lamb, and egg as its main source of protein, and, additionally, fulfils the fundamental nutritional needs of this special breed.